Paul McCartney shares archive photos of his band Wings to celebrate remastered albums . Beatles Radio: The Beatles, Solos, Covers, Birthdays, News The Fab 4 and More! Sir Paul McCartney has shared a number of archive photos from the early beginnings of his band Wings and the birth of their debut album Wild Life. The legendary musician is about to release a remastered and expanded edition of the 11th and 12th classic works from his catalogue: Wild Life and Red Rose Speedway. Several previously unreleased tracks were made available in advance of the release. Wings formed in 1971 and enjoyed a string of hits, including the James Bond soundtrack "Live and Let Die", and "Mull of Kintyre", which at the time became the best-selling UK single in history. Wild Life was made during July-August 1971 at Abbey Road Studios by McCartney and his wife Linda, along with Denny Seiwell on drums, and Denny Laine of the Moody Blues. 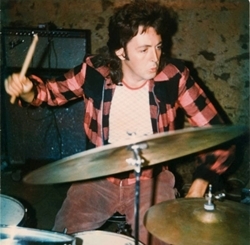 The majority of the tracks were laid down in a single take, and all songs were written by Paul and Linda McCartney – with the exception of a cover of Mickey and Sylvia's "Love is Strange".